Ethnographic Arms & Armour - A little help is welcome. A little help is welcome. 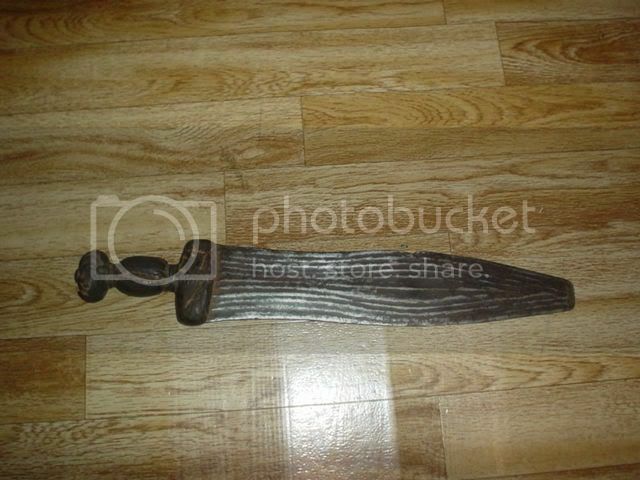 Some time ago, I found this sword in an antique shop in my home town. Although there were several African weapons in this shop, this one immediately struck my eye. It looked real 'rustic'. It was also of a design, I had never seen before. 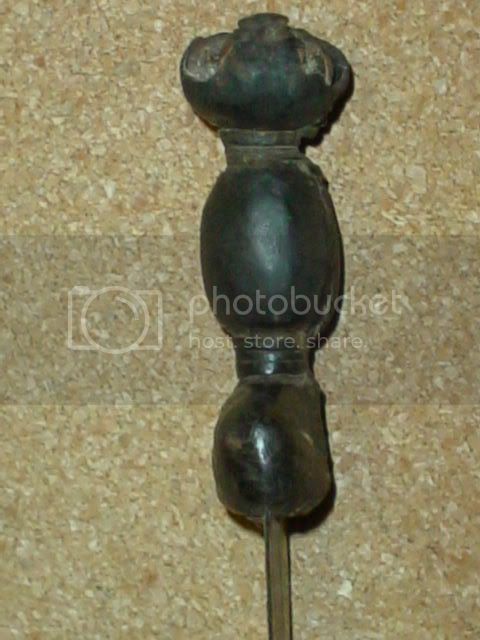 I did some research and contacted other African arms collectors, but the true origin of this piece remained a bit uncertain. My first thought was Cameroon. Reason for this was the leather covered handle on the sword. 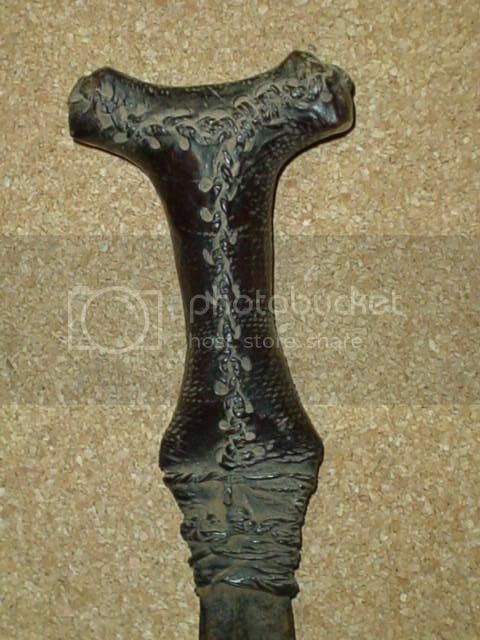 I have a sword attributed to the Bali-tribe in Cameroon which has its handle also covered in leather, but the design of the sword and its handle is quite different. 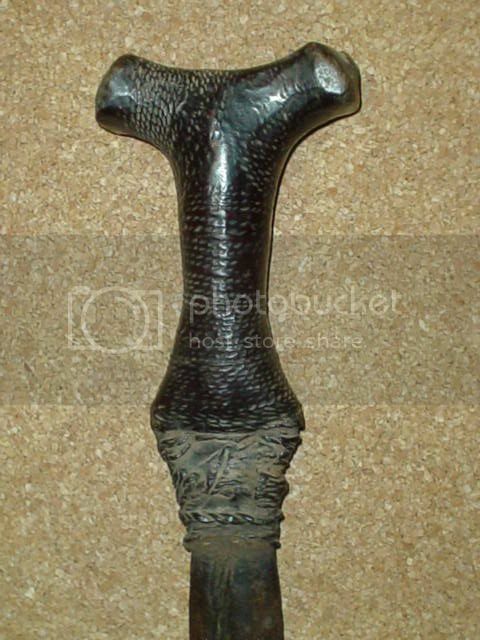 Although I am not well versed in African arms (or legs for that matter :D ) it does look kinda Kuba to my eye, reminding me of a Kuba knife. There are others who can tell you more accurately than I here. Fella's? I don't think it's Kuba. They don't use leather handles on their swords and knives. The shape of the blade is also different. The blades are often decorated with engravings, but these are more geometrical. Hi Freddy, this knife/short sword it's particular but very beautiful. I don't know with precision the provenience, but seems to me that remember some Tikar sword (Cameroon) in the "decoration" of the blade as you can see in some examples on Fischer/Zirngibl's Afrikanische Waffen. 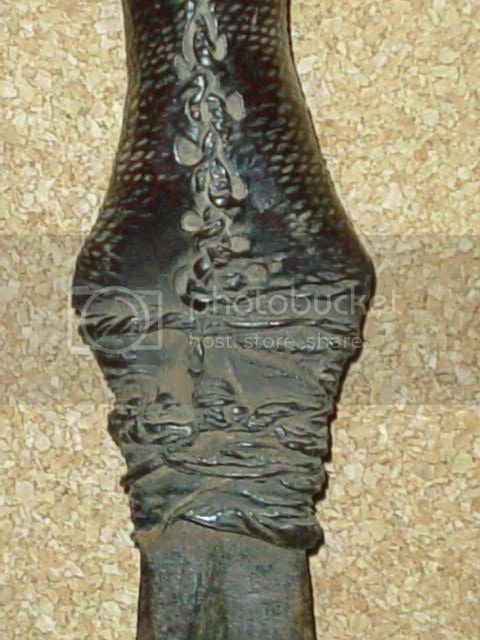 To the contrary the general shape it's similar to the Baule sword (a part the tip of the blade). I'm nagged by the feeling that the hide covering on the handle is not original, but perhaps a repair (?) 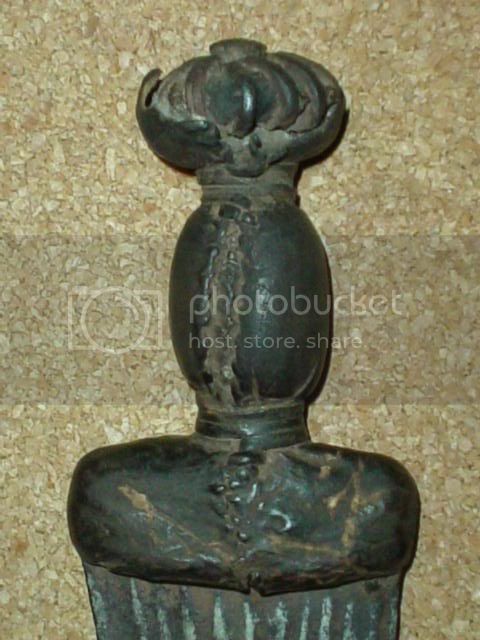 The carving on the pommel seems finer than would show well through it, and that doesn't seem "right". There's more, but start with that, if you will. You can look at the actual object, eh?....see what you think. 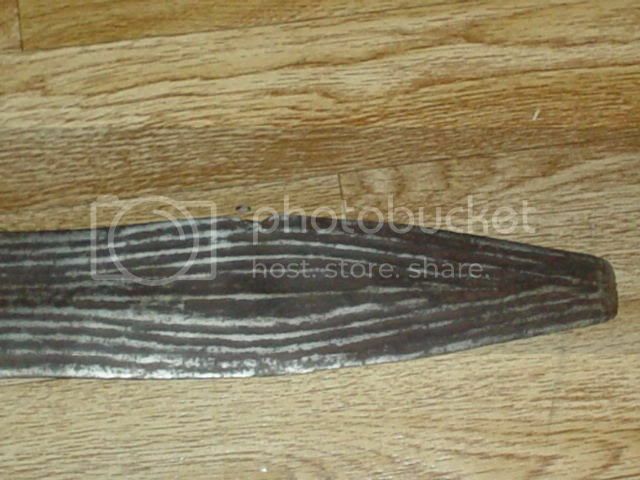 The blade is really nice, and the pommel carving looks nice, but the hide work looks fairly crude; field-repair to tighten a hilt? to weatherize it? to bind splits? I recently saw an old Mexican army sabre whose entire hilt, handle, pommel, and brass barred basket, had been (seemingly and allegedly originally) covered in leather. 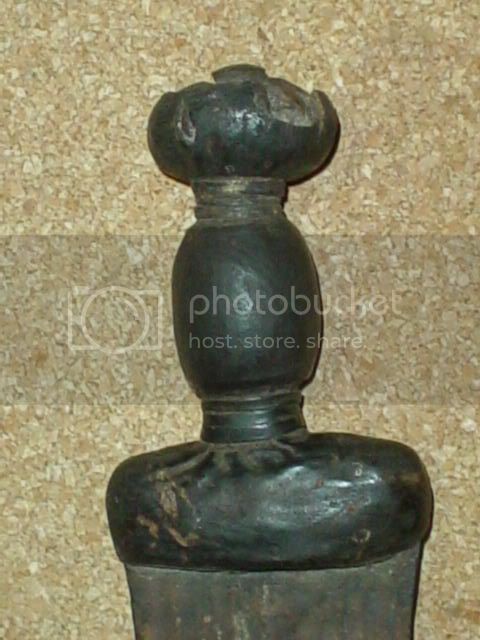 I know that leather covered hilts are common in much of Africa, but this work looks to me atypical, mainly in its crudity, and crudity as compared to both other pieces as well as to other elements of this piece? 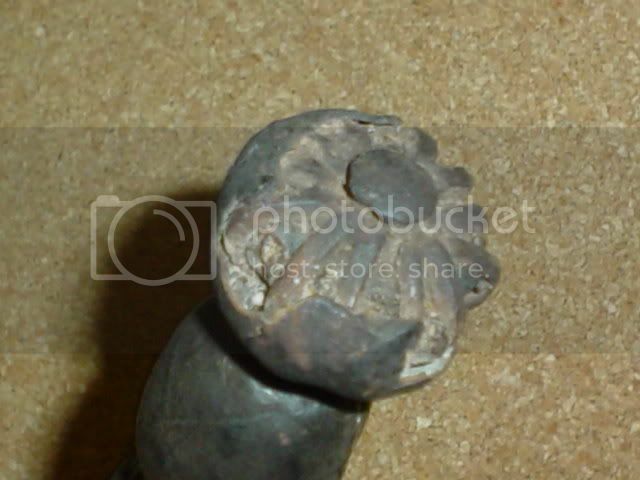 Hard for me to tell from the pics though, whether it's crudity or just drying/damage??????? I don't think the leather covering is a repair. 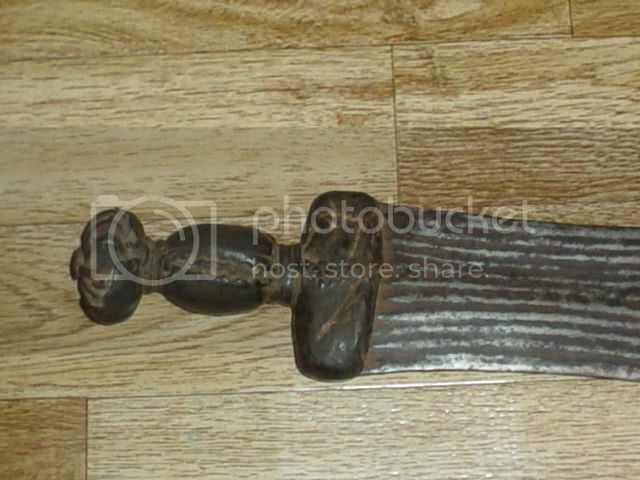 A lot of knives and swords from Cameroon have these. Look at the close-ups I made. First view is the front of the handle. Notice the iron banding on the handle. Second pic shows the back. The seam of the leather appears to be open. I think at one time the leather shrunk. In this thread Flavio showed some pics from Zirngibl and Fischer (by the way, a great book !). Notice the similarity in construction of the handle (not the shape, of course). Some kind of material, I think it's a piece of wood bound with cord, covered with leather. 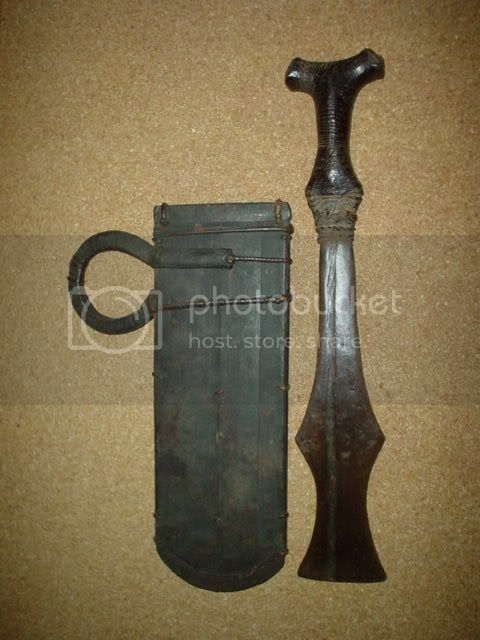 The second pic shows the front, the third the back of the handle. 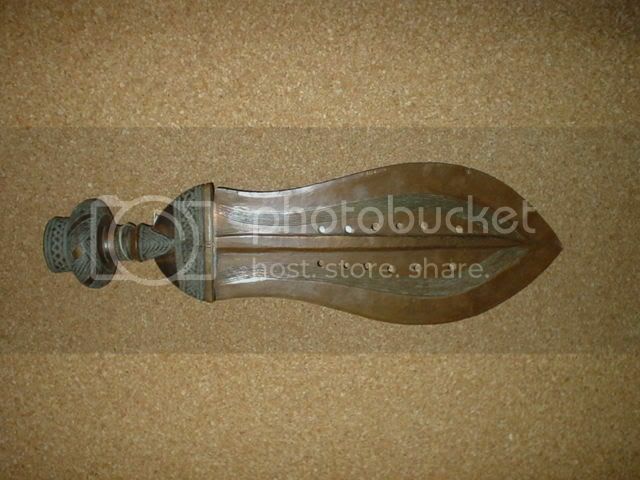 This sword is attributed to the Bali-tribe living in Cameroon. The sheath consists of some wooden pieces held together with rattan binding. The loop is also covered in leather. When I found this piece, I didn't know anything about it. I had never seen a similar sword, but I had to have it. I just couldn't resist. A friend pointed out to me that he found a similar one in the book of Zirngibl and Fisher.